New series coming in September 2015 from prizewinning graphic novelist Gene Luen Yang! From graphic novel superstar (and former high school computer programming teacher) Gene Luen Yang comes a wildly entertaining new series that combines logic puzzles and basic coding instruction with a page-turning mystery plot! SECRET CODERS will be the first title in a new series written by Gene Luen Yang and illustrated by Mike Holmes. Welcome to Silicon Hills Academy, a school which looks normal at first glance, but in fact is just crawling with mysteries to be solved! The founder of the school, the eccentric computer genius Maurice Babbert left many clues and mysteries for enterprising students to solve. Using their wits and their growing prowess with coding, Hopper and her friend Nikhil are going to solve the mystery of Silicon Hills Academy no matter what it takes! GENE LUEN YANG began drawing comic books when he was still in grade school. In 1997, he received a Xeric Grant for Gordon Yamamoto and the King of the Geeks, his first comics work. He has since written and drawn a number of titles, including the comics series Avatar: The Last Airbender. American Born Chinese, his first graphic novel from First Second, was a National Book Award finalist, as well as the winner of the Printz Award and an Eisner Award. He also won an Eisner for The Eternal Smile, a collaboration with Derek Kirk Kim, and the 2014 LA Times Book Prize for Boxers & Saints, which was also a finalist for the National Book Awards. Translation rights have been sold to many of his books. 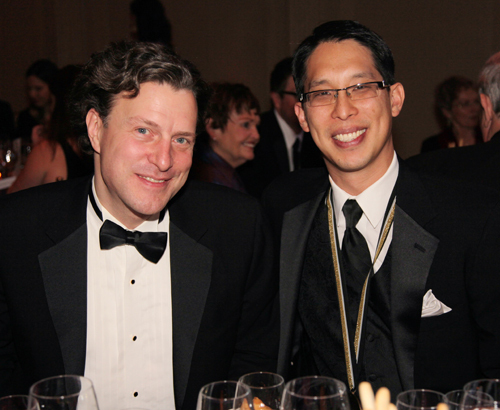 Gene Luen Yang with First Second Editorial Director Mark Siegel at the 2013 American Book Awards.